The 2nd edition of “Lonavala International Film Festival India” ( LIFFI) is all set to enthrall audiences once again from 1st to 3rd September, 2017 at Triose Plaza, Ryewoods, INS Shivaji Road, Lonavala. The theme this year is “Family Entertainment” & “Edutainment”. With the Objective of educating core family & moral values to Children through Cinema. Schools, Orphanages & NGO’s in and around Lonavala are invited to send their children to enjoy the experience free of cost. August 2017, Lonavla : After an overwhelming response to the 1st edition of the festival held last year, It’s time once again to enchant audiences with a wide range of entertaining films in the mystic valleys of Lonavala. This year as well, LIFFI has set the right tone to offer its visitors and patrons a completely different and a memorable “Cinematic Experience”. Cinema lovers shouldn’t miss this treat of watching 32 entertaining national and international films across various genres that will be screened in the “state of the art” Triose Plaza”. Each film will be a one of its kind experience for each and every person. The official content partners onboard for “LIFFI 2017” are Ultra Media and Entertainment Pvt Ltd, Rajshri Productions, Children Film Society of India, K Sera Sera, Vinay Pictures and Smile Foundation. Like last year, this year too, many visitors are expected to watch path breaking films in this festival at the scenic hill station of Lonavala over the weekend. Last year, several esteemed artists and film makers from the Indian film industry like Shyam Benegal, Naseeruddin Shah, Ketan Mehta, Govind Nihalani, Sudhir Mishra, Anant Mahadevan, Deepa Sahi, Rajit Kapoor and many more graced the event. Veteran filmmaker Govind Nihalani was presented the “Lifetime Achievement Award” by ace filmmaker Shyam Benegal. Other than the internationally acclaimed films like Pyaasa, Tamas, ArdhSatya, Drohkaal many commendable short films and documentaries were also screened. Interactive question and answer sessions were conducted and moderated by eminent personalities on various aspects of cinema and filmmaking. Visitors flocked in from all corners of the country to cherish the experience. “Lonavala International Film Festival India” is organised by Triose Plaza and the festival Director is Mr. Madhav Todi. The Chief Patron for the festival is Mr. SushilKumar Agrawal, Managing Director, Ultra Media and Entertainment Pvt Ltd. 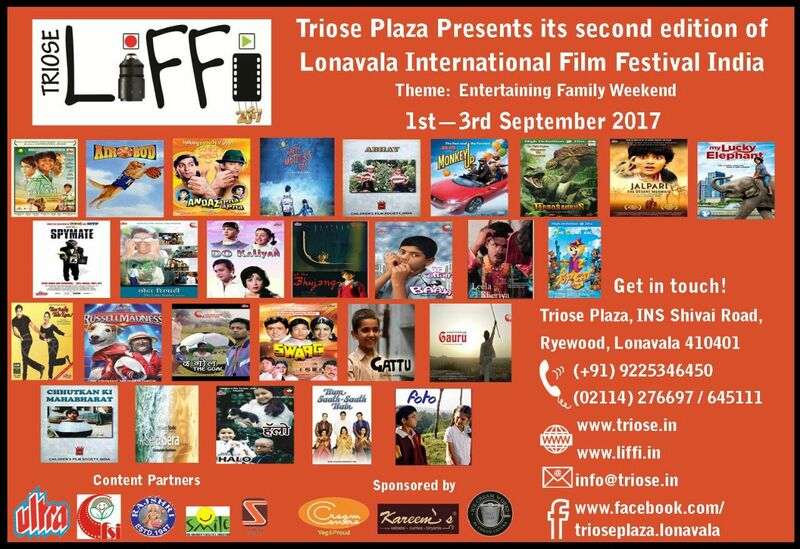 So, mark your calendars and join us to experience an entertaining and edutaining weekend with your family at Lonavala international Film Festival India 2017 from 1st to 3rd September at Triose Plaza, Lonavala !